GrandBox Review by Denise Murray Wong | Delivering the Gifts of GrandBox for All Occasions and Just Because! How thrilling does it feel when you receive a TLC package to your door? Realistically, at my house, a package in the mail usually means that I indulged in an online shopping spree. Sharing the joy by giving a little something special to family and friends is just as much of a thrill. 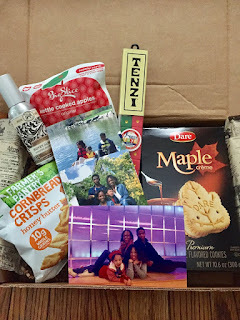 We're excited to find a way to send a care package to keep my kids connected to Nana and Grandma when travel for visits aren't in the immediate plans. Thank you to Team GrandBox for the courtesy of providing promotional product for editorial content purposes as a US Family Guide Ambassador. The creativity and convenience of GrandBox curates themed monthly subscription boxes bringing the fun of Autumn Harvest, Farmer's Market Fun, or Movie Night at the Drive-In, in a care package created especially for seniors to enjoy. Your box of goodies is delivered to your special person, including 5 full size products, a few family photos and a little personalized note. Team GrandBox is headed by the talents of Andy Papier, Joe Yeoman, and Alison Fields. Initially sending their first GrandBoxshipments in March 2014 families and friends are able to stay in contact with loved ones, near by and far away. GrandBox strives to deliver special surprises in time for the holidays or birthdays minus all of the knick-knacks, tchotchkes, or sugary sweet treats many are looking to avoid. GrandBox is a personalized monthly subscription box specially curated specifically for seniors aged 65 and up. Click here to gift a GrandBox! As the owner of this blog, niecyisms and nestlings, I am compensated to provide my opinion on products, services, websites and various other topics. This blog may contain affiliate links. Even though, as the writer/owner of this blog receiving compensation for posts or advertisements, I will always give my honest opinions, findings, beliefs or experiences on those topics or products. This blog abides by word of mouth marketing standards. I believe in the honesty of relationship, opinion and identity. The views and opinions expressed on this blog are purely my own. Any product claim, statistic, quote or other representation about a product or service should be verified with the manufacturer, provider or party in question.How thrilling does it feel when you receive a TLC package to your door? Realistically, at my house, a package in the mail usually means that I indulged in an online shopping spree. Sharing the joy by giving a little something special to family and friends is just as much of a thrill. We're excited to find a way to send a care package to keep my kids connected to Nana and Grandma when travel for visits aren't in the immediate plans. 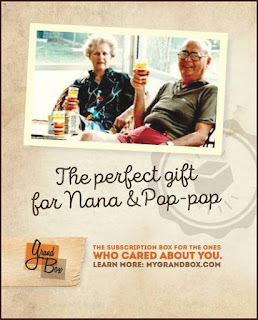 Delivering the Gifts of GrandBox for All Occasions -and Just Because!